My printed cards have small unprinted areas. What�s wrong? The colors on my printed cards look very light. Monochrome printing is uneven or is missing in some areas. I am experiencing card jams. How do I fix that? I get error 109: Print ribbon problem. What�s wrong? 1. My printed cards have small unprinted areas. What�s wrong? 2. The colors on my printed cards look very light. Verify that the ribbon is loaded properly. Make sure that the cards were not previously printed. Use new cards. Check that printhead is installed correctly. The printhead power is too low. Log on to the Printer Manager as a WebAdmin. Open the Printer Settings > Print menu. Increase the YMCPower setting, and press the Set Current button to save your changes. 3. Monochrome printing is uneven or is missing in some areas. The monochrome (K) power setting is too low. The cards require a different setting. Increase the monochrome intensity gradually and check results. 4. I am experiencing card jams. How do I fix that? The card did not reach the position for the next action, such as printing or ejecting the card. You usually can resolve the error by pressing the USER button so that the printer displays Ready. If the error persists, do the following to remove the card from the printer. Remove the print ribbon cartridge. Turn the manual advance knob to move the jammed card until it is accessible from the rollers. Replace the ribbon cartridge and close the printer. Press the USER button on the printer or click Retry in the message box. 5. I get error 109: Print ribbon problem. What�s wrong? The print ribbon is not moving properly. Open the printer and remove the ribbon cartridge. Reposition, repair, or replace the ribbon and advance the repaired area one full turn. If the ribbon is torn, you can tape the 2 ends back together. Press the USER button on the printer. In the message box, click Retry, or click Cancel to cancel the card. 6. How do I print a test card? 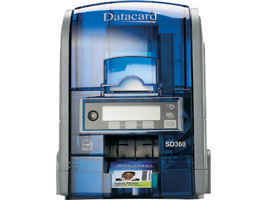 The printer includes a test card that runs without using a driver or other source of card data. Use it to verify that the printer is working. Begin with the printer Ready. The USER button shows steady green. Press the USER button to display Suspended on Line 1 of the LCD panel. Press ENTER to enter the menu system. Press ENTER to enter the Maintenance menu. Press the down arrow until Test Card displays on Line 2. With Test Card displayed on Line 2, press ENTER to display Start on Line 2. Press Enter to print the test card. After the card prints, the printer returns to Ready. 7. How do I clean the printhead? 8. How do I clean the printer?